Shake things up with the scent of a refreshing glass of caipirinha. Molton Brown’s Caju & Lime blends caju fruit* extract with spearmint and lime to create a radiant, joyful and effervescent fragrance. The notes include lime, grapefruit, orange, lemon, spearmint, clary sage, galbanum, cypress, musk and oak moss. 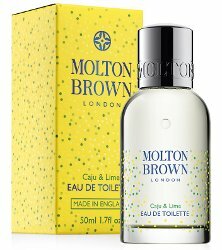 Molton Brown Caju & Lime can be found now at Harrods in the UK, in 50 ml Eau de Toilette, £36, and in matching body products. * aka the cashew apple or marañón. I love the Molton Brown line of shower gels, but have never tried any of their perfumes. Can anyone tell me what they think of them? Do they last a good amount of time? I’m curious. I’m not sure I would want the Caju and Lime as a perfume, but the notes sound amazing for a refreshing shower gel. I’ve never used one, so no help, sorry! Caipirinha’s are great to drink on a warm day, but they dont smell like much. The cocktail is just comprised of Lime, Sugar, and Cachaça. I wonder who wears Molton Brown? I remember thinking they were on par with the likes of Bath & Body Works.